How to Register Online FIR in KPK Police? 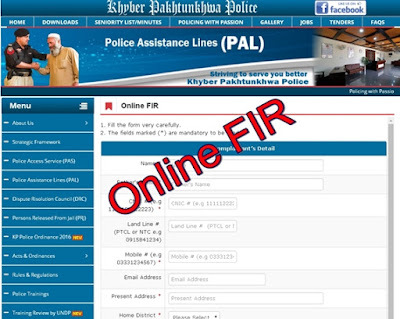 KPK Police allows people to register Online FIR to get help from the. Now Khyber Pakhtunkhwa citizens can lodge their complaints to police online against any distressful situation and Police will be responsible to help you out. People living anywhere in any district of KPK can use this service without any hassle. In order to file an FIR, people are required to visit KPK Police website. Where they have to provide some basic details about themselves (i.e. Name, CNIC, Phone Number, District and Police Station) and about the incident (i.e. date, time and place of incident etc). How to Register Online Complaint against KPK Police? In case any person have any complaint against KPK Police, a separate webpage has been developed to register such complaints. Where the complainant can register against any personnel of KPK Police from Constable to IG of Police. If any Police Station refuse to register an FIR or you find anyone involved in the corruption, you can use this online service to register your complaint about him and hopefully you will get justice. Simply pick your district from drop down menu from all the districts of KPK (Abbottabad, Bannu, Batagram, Buner, Charsadda, Chitral, D.I. Khan, Dir Lower, Dir Upper, Hangu, Haripur, Karak, Kohat, Kohistan, Lakki Marwat, Malakand, Mansehra, Mardan, Nowshera, Peshawar, Shangla, Swabi, Swat, Tank, Torghar). And select the designation against whom you want to register complaint (Constable, Head Constable, Assistant Sub Inspector (ASI), Sub Inspector, Inspector, Deputy Superintendent of Police (DSP), ASP, SP, SSP, AIG, DIG and IGP). Fill other details and submit it. It will not only allow citizens to reach police in that simple way but also save them to visit police stations in order to file their complaints against any criminal act. Such type of online services should also be introduced in provinces of Pakistan. Complain to IG Police Punjab Lahore. Sir retired Ex Army ki bharti March 2017 ma bezabgi hoi ha example 10% quota per 10% Ex Army persons ki selection nhi ho rahi.Selection me Ex Army ka phsycal nhi hona chae wo pehly se ye kam kr ki aya ma khud From no.Police 5596 & (Riverine) 272 Mianwali police me documents jama kara chuka hoan afsoos cruption ki nazar ho gi hain.